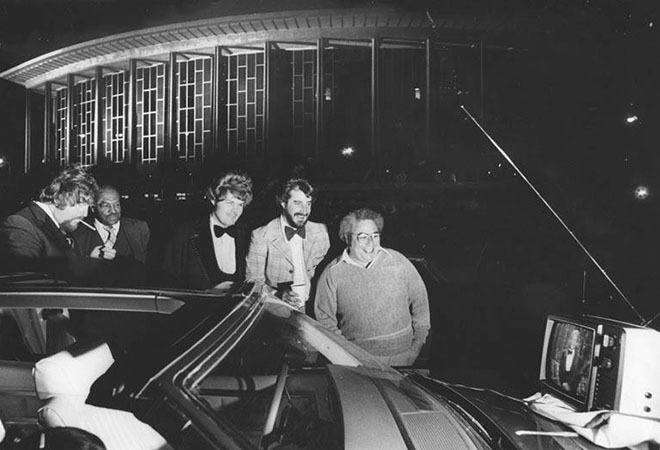 Caption: Oscar-night chauffeurs watch the 51st Annual Academy Awards on a TV set atop an Eldorado Biarritz outside the Music Center Pavilion on the breezy night of April 10, 1979. Could that actually be Nick Nolte’s stunt double lighting his cigarette on the far left? And remember when TVs had antennas? Today the TV sets are IN the limousines, and most likely the ceremony is being watched on smart phones and iPads. The Music Center will be celebrating its 50th anniversary this year. The opulent plaza, designed by Welton Becket and Associates, first started construction in 1962 in the heart of downtown Los Angeles. Bunker Hill was razed to make room for this futuristic pavilion, completed in 1964. Alison Martino is a writer, television producer, and personality, and L.A. pop culture historian. She founded the Facebook page Vintage Los Angeles in 2010. In addition to CityThink and VLA, Martino muses on L.A.’s past and present on Twitter and Instagram.